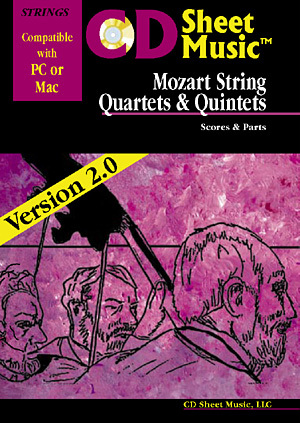 Mozart String Quartets and Quintets - Scores and Parts. Version 2.0. Over 1100 Pages! This disk contains the study scores and parts of all 23 of Mozart's String Quartets as well as the five String Quintets and Eine Kleine Nachtmusik. Version 2.0 adds articles on Mozart, String Quartet and related articles from the 1911 edition of Grove's Dictionary of Music and Musicians.